Copyright David Lally and licensed for reuse under this Creative Commons Licence Situated on a rocky ledge in the Atlantic Ocean off the south-western tip of the Isles of Scilly. This ledge is 46m long by 16m wide. Coordinates: 49º 52' 24" North. 06º 26' 41" West. Flash Characteristics: 2 white group flashes every 15 seconds. The Bishop Rock is in the Guinness Book of Records as the smallest island with a building on it. Bishop Rock was the last of the West Country lighthouses to remain manned. It is now reached by helicopter, landing on the helipad at the top. This helipad features in one of the BBC One 'between-program' identifiers. The first attempt at building a lighthouse on the Bishop Rock started in 1847. Designed by James Walker, the tower stood on 6 iron legs or piles, in the belief that this would allow the waves to break around the legs. The tower was completed and awaiting the installation of it's lighting apparatus, when it was destroyed and swept away by an Atlantic storm on February 5th 1850. The second attempt in 1858 resulted in the current granite tower that has survived over 150 years. It was, however, strengthened and upgraded between 1881 and 1887, by Sir James Douglass, which included a new outer wall and another 12 metres in height. The original tower forms the central core of the lower part of the current lighthouse. 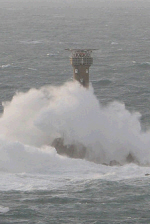 On 5th Febuary 1994 the solid bronze doors of the Bishop Rock lighthouse, despite being situated 40ft above sea level and weighing over 100kg each, were smashed open by enormous waves during a storm, clearly demonstrating the power of the sea in this part of the Atlantic. Steel sheets covered the entrance until new doors were installed, at a cost of nearly £20,000, in 1996. Situated on a rock in the English Channel 13 miles south-west of Plymouth and 9.4 miles (15.1 km) south-south-west of Rame Head. Coordinates: 50º 10' 80" North. 04º 15' 90" West. 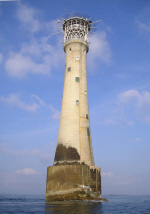 The first lighthouse on Eddystone Rocks was an octagonal wooden structure built by Henry Winstanley. Construction started in 1696 and the light was lit on 14 November 1698. After the first winter it was in need of major repair. Winstanley rebuilt most of the structure, changing it to a dodecagonal (12 sided) stone clad exterior on a timber framed construction with an octagonal (8 sided) top section. During the Great Storm of 1703 it disappeared almost without trace on 27th November. Henry Winstanley was on the lighthouse, completing additions to the structure. No trace was ever found of him. This was built by John Rudyerd as a conical wooden structure around a core of brick and concrete. 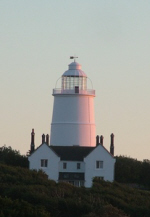 A temporary light was first shown from it in 1708 and the work was completed in 1709. This proved to be more durable than Winstanley's Tower, surviving nearly fifty years until it burnt down on 2nd December 1755. One of the lighthouse keepers Henry Hall had discovered that a spark from the lamp had set the roof alight. He and his two companions were unable to put out the fire and they were forced to retreat down the tower until eventually the lighthouse burned down to the rocks. The next day, in spite of a storm, they were rescued by boat but they had to be pulled off the rock and through the raging waters by rope. Henry died on the following Monday, 8th December 1755, aged 94, at his home in Plymouth. The autopsy showed that he had died from swallowing over 7 ounces of molten lead during the attempts to quell the fire. The actual piece of lead found in Henry's stomach is now exhibited in the National Museum of Scotland. 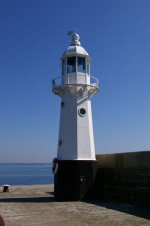 Trinity House placed a light vessel to guard the position until a permanent light could be built. 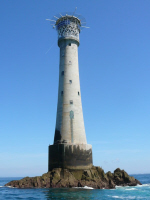 The third lighthouse on the Eddystone Rocks, built by civil engineer John Smeaton, was modelled the shape the trunk of an oak tree and built of granite blocks. Smeaton pioneered the use of 'hydraulic lime', a concrete that will set under water. He also developed the technique of securing the granite blocks using dovetail joints and marble dowels. In the late 1870s it was discovered that the rock under the lighthouse was starting to crack. Trinity House decided to replace it with a new lighthouse built on an adjacent rock. The City of Plymouth paid for Smeaton's lighthouse to be dismantled and rebuilt on Plymouth Hoe. It is regularly open to the public. In the Oil Store there is a quotation around the wall from Psalm 127: "Except the Lord builds the house they labour in vain that build it." 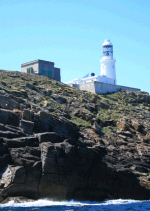 The base of Smeaton's lighthouse still remains on the rock next to Douglass's lighthouse (see picture below). First lit on 16th October 1759. 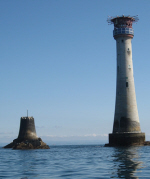 This is the current lighthouse on Eddystone Rocks. It was designed by James Douglass, following Robert Stevenson's improvements to Smeaton's techniques. Automated in 1982. 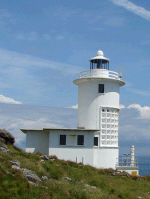 The first off-shore lighthouse to be automated in the UK. Flash Characteristics: White group flashing twice every 10 seconds. Fog Signal Characteristics: 3 blasts every 60 seconds. Copyright Ray Beer and licensed for reuse under this Creative Commons Licence. Situated on Godrevy Island about 300 yards off Godrevy Head at the north-east end of St Ives Bay. On the seaward side of Godrevy Island is a submerged reef known as the Stones which extends for approximately a mile (1.6 km) across the eastern approach to St Ives Bay. Godrevy lighthouse was built to warn of the danger of this hidden reef following the wrecking of the SS Nile on 30th November 1854 with the loss of all passengers and crew. It is constructed of rubble-stone & mortar and has an octagonal tower. Coordinates: 50º 14' 05" North. 05º 23' 09" West. Range: White - 12 nautical miles, Red 9 nautical miles. First lit: 1st March 1859. Converted to Solar Power: 1995. Intensity: White Sector 4370 Candela, Red Sector 817 Candela. Lamp: 75 Watt tungsten halogen. Flash Characteristics: 1 white & red flash every 10 seconds. 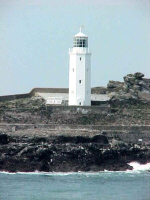 It is reputed that the novelist Virginia Woolf got her inspiration for her novel To the Lighthouse from a visit to Godrevy Island on 12 September 1892. However, in her book the lighthouse is located in the Hebrides. The island is a natural haven for wildlife including grey seals, cormorants, various gulls, oyster-catchers and pipits. In 2005 Trinity House decided to de-activate the station. The decision was reversed after it was proved that the light is essential to local fishermen and yachtsmen sailing in the area. 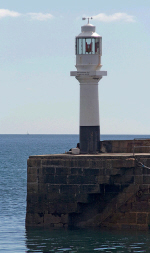 This is a tall square, white painted with a red stripe, precast concrete tower lighthouse with a window light, standing on four legs, currently operated by the Hayle Port Authority. It is situated on the edge of the St Erth to St Ives branch railway line at Lelant golf links overlooking the disused Hayle harbour. The front low light is of a similar construction. The tower is 15 feet high and there is evidence that this is a replacement rear light for a similar type that stood on the same site. Lights have stood on these sites since 1840 and are visible for 6 miles. The distinctive twin towers of the Lizard Lighthouse mark the most southerly point of mainland Britain. 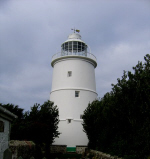 The first lighthouse was financed by a philanthropic Cornishman, Sir John Killigrew, and completed in late December 1619. Lack of financial support and an unwillingness of owners of the ships passing the lighthouse to make any contribution resulted in Killigrew being declared bankrupt. The first Lizard Lighthouse was demolished in 1623. After 100 years without a warning light on this hazardous part of the Cornish coastline, the current lighthouse, built by Thomas Fonnereau, was completed in 1751. 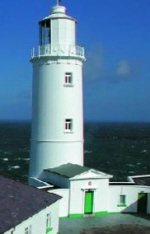 Trinity House took on responsibility for the Lizard lighthouse in 1771. The building consists of two towers, with cottages built between them. The Western Tower was discontinued soon after 1903 and a single flashing light installed in the Eastern Tower. Coordinates: 49º 57' 58" North. 05º 12' 07" West. Range: 26 nautical miles (48 km). Flash Characteristics: 1 white flash every 3 seconds. Fog Signal Characteristics: 1 blast every 30 seconds. The Longships Lighthouse situated on the Longships Rocks, a mile west of Land's End. The first tower was built by a Lieutenant Smith in 1795 but it was quite short (about 12m). Although the tower was strong enough, when the sea was very fierce the waves regularly broke over the little lighthouse causing the light beam to be interrupted or obscured and its signal became confusing or lost altogether. In 1873 it was replaced by a new taller tower, designed by Trinity House’s engineer Sir James Douglass (who a few years later created the present Eddystone lighthouse). Coordinates: 50º 03' 97" North. 05º 44' 75" West. Flash Characteristics: White and red isophase every 10 seconds(light 5 seconds, eclipse 5 seconds). Fog Signal Characteristics: 1 blast every 10 seconds. The artist William Turner captured the power of the seas around the lighthouse in his watercolour entitled 'Longships Lighthouse, Land's End'. There is a squat white painted brick hexagonal castellated tower lighthouse with a window light situated on the edge of the harbour wall at Marazion in Mounts Bay. The light is now disused. 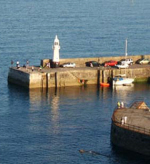 Mevagissey Harbour Lighthouse is situated at the end of the outer harbour wall in Mevagissey. This is now known locally as Lighthouse Quay. The construction of the harbour to its present state was undertaken in various stages, with the construction of the outer harbour walls being completed in 1888. These were virtually destroyed in the great blizzard of 1891, and were rebuilt and completed by 1897. The new wall on the southern side of the outer harbour included a new lighthouse. 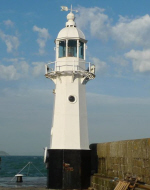 The lighthouse is a cast iron hexagonal tower, painted white with a black base of a similar design to the newer lighthouse on St Ives Harbour Wall. Coordinates: 51º 16' 01" North. 04º 46' 09" West. Flash Characteristics: 2 White flashes every 10 seconds. The remains of a cast iron lamp post acting as a navigation light can be seen on the corner of this disused harbour. Disused and given to the National Trust in 1948 the harbour light base may well date back to the 1840s. Located at the end of the South Pier. The circular lighthouse is 10 metres tall, made of cast iron and was built in 1914. The white light flashes once every five seconds. It is a welcome sight to the returning Newlyn fishing fleet. The north harbour wall is marked with a green light on a lamp-post. Pendeen lighthouse stands at the top of sheer cliffs on a headland to the north of the village of Pendeen, between St Just and St Ives. The buildings occupy a large area and before work could begin the cap of the Point had to be removed and the whole headland flattened, which necessitated the building of a huge retaining wall on the seaward side. Two of the four former lighthouse keepers cottages are now holiday accommodation called called Argus Cottage and Solebay Cottage. Coordinates: 50º 09' 85" North. 05º 40' 20" West. Flash Characteristics: White group flashing 4 times every 15 seconds (light 5 seconds, eclipse 5 seconds). Fog Signal Characteristics: 1 blast every 20 seconds. Peninnis lighthouse stands on Peninnis Head on the southern tip of the island of St Marys on the Ilses of Scilly. Coordinates: 49º 54' .273 North. 006º 18' .221 West. Height above sea level: 36m. Flash Characteristics: White Flash Every 20 Seconds. The first lighthouse was set up in 1817. The current lighthouse was added to the south-eastern arm of the harbour, known as the South Pier or Albert Pier, in 1855 when the pier was made stronger and longer. Coordinates: 50º 07' 06" North. 05º 31' 71" West. Flash Characteristics: Red flash every 5 seconds with white sector. 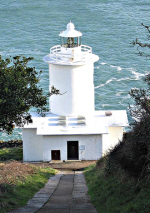 There is a white painted brick structure with an ordinary navigation light on top, situated on Spy House Point and operated by the local Harbour Authority. There is an access door in the base which is no longer used now that the light is automated. It was built in 1911, the tower is 10 feet high and the light is visible for 8 miles. On the Western Pier there is a light on a stone structure which is visible for 4 miles. Round Island is the most northerly island of the Isles of Scilly. It is a mass of granite rising 40m above sea level. The top of the island, being relatively flat, formed a platform on which Trinity House built a lighthouse and dwellings in 1887. This was carried out under extreme conditions. The sheer rock face made the unloading of building materials almost impossible and steps had to be cut into the solid granite. Apart from flying in by helicopter (there is a helipad outside the lighthouse compound), the steps are the only means of getting onto Round Island, Since automation of the light, in 1987, Round Island has been uninhabited. Coordinates: 49º 58' 70" North. 06º 19' 35" West. Flash Characteristics: 1 White flashes every 10 seconds. Fog Signal Characteristics: 4 blasts every 60 seconds. The Sevenstones light vessel is moored off the Sevenstones Reef, 10 miles north east of the Isles of Scilly. Coordinates: 50º 03' North, 06º 04' West. Most light vessels are now solar powered and unmanned. September 1958 to 1980 Lightvessel No. 19. 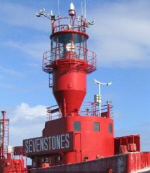 1998 to 2001 Lightvessel No. 22. 2001 to 2003 Lightvessel No. 19. 2004 to date Lightvessel No. 2. 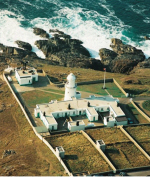 The oldest lighthouse on the Isles of Scilly was built by Trinity House in 1680 on St Agnes, the most southerly inhabited island in the Scillies. Originally it was coal fired in an open basket but converted to oil in 1790, when it had copper lamps with 21 revolving reflectors. The stone tower is 74 feet (23m) high and the light is 138 feet above mean high water. 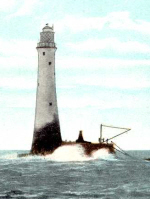 It was replaced by the Peninnis lighthouse in 1911. There were adjoining two-storey keepers’ houses, also painted white. These are now a larger private residence and the tower no longer has a light, although it does still function as a daymark for shipping. St Anthony's Head is situated on the eastern side of the entrance to Falmouth Harbour, at the end of the Roseland Peninsula. The purpose of the lighthouse is to guide shipping around the Manacles Rocks, which are south of the harbour entrance and to warn of the dangers of Black Rock, which sits right in the middle of the channel into the harbour. Prior to 1954 the fog signal was a huge bell which hung outside the tower. St Anthony lighthouse's modern claim to fame is that it featured in the opening credits and many scenes of the 1980's children's television series 'Fraggle Rock'. The adjoining keepers’ cottage has now been converted into a holiday let, called Sally Port Cottage, which has some stunning views. Ear plugs will be required if the weather gets foggy. Coordinates: 50º 08' 40" North, 05º 00' 09" West. Range: Main Light: White Sector: 22 nautical miles. Red Sector: 20 nautical miles. Intensity: White Sector: 210,000 Candela. Red Sector: 42,000 Candela. Flash Characteristics: White and red every 15 seconds. Fog Signal Characteristics: 3 second blast every 30 seconds. This is a squat red painted cast iron circular tower lighthouse with a traditional light, resting on an octagonal tower concrete plinth, currently operated by the local Port Authority. It is situated on the cliff edge at St Catherines Point at the mouth of the River Fowey. The tower is 20 feet high and the light is visible for 15 miles. Halfway down Smeatons pier is a Lighthouse. It was designed by John Smeaton and constructed in 1831. The squat 6 metre tower has a square base that tapers into an octagonal gallery surrounded by railings. It has a domed roof with a decorative weather vane depicting a small sailing barge. In 1996 a fire almost destroyed the tower but it was saved and has been restored. This lighthouse is now used to indicate if it is safe to enter the harbour (green) or not (red) as the harbour has very little water at low tide. At the time of construction this lighthouse was at the end of the pier but when the pier was extended at the end of the century it was in the middle. A new lighthouse was constructed at the end of the extended pier in 1890. 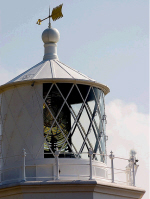 This lighthouse is 9 metres high, of octagonal design, made of cast iron and painted white with a black base. It is very similar to the Mevagissey Harbour lighthouse. The tower shows two green lights, one from the top lantern and one halfway down. This is the newest lighthouse in Cornwall. Tater Du is a headland to the south-west of Penzance and south-east of St Buryan. The red sector light warns shipping of the Runnelstone Rocks and the main light warns of the dangerous Boscowen Point. This lighthouse was never manned, having been built with an automatically-controlled light. It was designed by Michael H Crisp. Coordinates: 50º 03' 12" North, 05º 34' 60" West. Range: Main Light: 23 nautical miles. Sector Light: 13 nautical miles. Flash Characteristics: Main light: Three white flashes every 15 seconds. Sector light: Fixed red, 4 white flashes every 15 seconds. Fog Signal Characteristics: 2 blasts of 1 second every 30 seconds. Trevose Head is west of Padstow, near Constantine Bay. A lighthouse here was considered as early as 1809. There was no lighthouse on the North Cornish coast between the Longships at Lands End and the South Lundy Light off the North Devon coast. 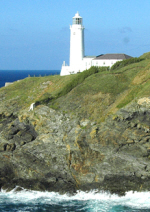 It was not until 1st December 1847 that Trevose Head Lighthouse was first lit. On 6th February 1913 the fog signal was added. It took the form of a very large trumpet; 36 feet long with the aperture 18 feet by 2 feet. It was expected that this shape would give a wide horizontal spread of sound. It stayed in use until the new fog signal was introduced in 1963 - a Supertyphon with 8 horns. The four semi-detached keepers cottages, two each side of the light, are holiday lets (Nimbus Cottage, Verity Cottage, Pelorus Cottage and Brook Cottage). Access is via a mile long private road. Coordinates: 50º 32'.92 North, 05º 02'.07 West. Lamp: 35 Watt metal halide. Flash Characteristics: 1 white flash every 7.5 seconds. Fog Signal Characteristics: 2 blasts every 30 seconds. There is a red painted circular metal drum lighthouse supported on a single metal column with a letter box light currently operated by the local Port Authority and situated on the edge at Whitehouse Pier. The tower is 20 feet high and the light is visible for 8 miles. It was secondhand when it was placed here in 1904. The Wolf Rock stands 4 miles south-west of Lands End. The name may come from the unique howl heard when the wind blows through the fissures in the rock or from the idea that the shape of the rock is like a wolf's head. The original building in 1795 was just an unlighted beacon or daymark. It could not stand up to the ferocity of the Atlantic waves and soon washed away. 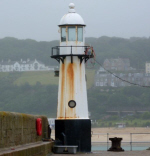 From 1836 to 1840 an iron beacon, built by lighthouse builder James Walker, stood on the rock and part of it still remains today as part of the landing stage. Construction work was very difficult due to the nature of the seas. It was recorded that in 5 years there were only 302 hours during which the work could be carried out. 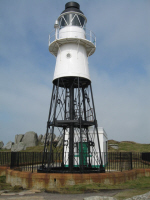 The cost of constructing the beacon was £12,000. In 1861 James Walker started on a granite tower based on Smeaton's Eddystone tower. Again progress was slow because of the environment. By the end of 1864 only 37 blocks in the 2nd course of masonry had been laid. The tower was finally completed on 19th July 1869 and first lit early in 1870. 3,297 tons of granite were used in constructing the tower and 1,078 tons of granite in constructing the landing platform. 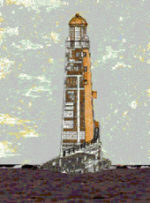 The Wolf Rock Lighthouse is famous for being the first rock lighthouse to have a helideck constructed on top of the lantern housing. 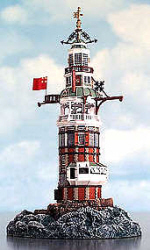 This became the prototype of many offshore Trinity House lighthouses. Coordinates: 49° 56'.72 North 05° 48'.50 West. Flash Characteristics: White flash every 15 seconds.